JONESBORO, Ark. – Construction activity has escalated on the privately funded, $75 million Arkansas State University campus in Queretaro, Mexico, Chancellor Tim Hudson said today. Arkansas State University Campus Queretaro (ASUCQ), a private business foundation in Mexico, has acquired 2,125 acres for a comprehensive community development plan near Queretaro. The 370-acre A-State campus will be the focal point of the project, which will include commercial, residential and recreational components for up to 70,000 residents. 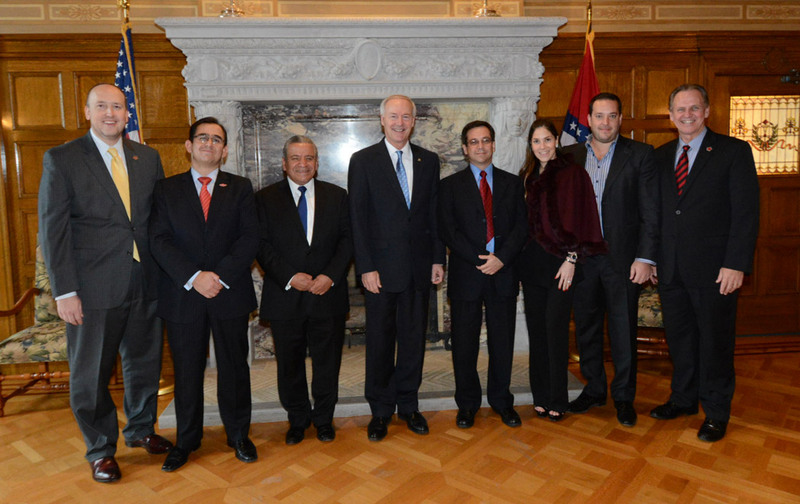 In recent weeks, government leaders from Queretaro visited Arkansas Gov. Asa Hutchinson and the Jonesboro campus for updates and discussions about the partnership. Hudson, Vice Chancellor for Student Affairs Rick Stripling and Chief Information Officer Henry Torres also met in Queretaro with newly elected Gov. Francisco Dominguez and toured the construction site. Pictured in the Governor’s Conference room at the Arkansas State Capitol in Little Rock are (from left) Chuck Welch, President of the Arkansas State University System; Edmundo Ortiz, general director of ASUCQ; Alfredo Botello, Secretary of Education for the State of Queretaro; Arkansas Gov. Asa Hutchinson; Eduardo Presa, Director of Government Innovation and Global Affairs for Queretaro; Belinda Salazar, executive for Servicios Independientes de Consultoria; Ricardo Gonzalez, Chairman of ASUCQ and CEO of Servicios Independientes de Consultoria; and Tim Hudson, Chancellor of Arkansas State University. “The campus layout is now visible with substantial earth work completed, steel beams going up for the Student Union and multiple levels of infrastructure being installed,” Hudson said. ASUCQ Chairman Ricardo Gonzalez said he expects completion of the first phase of the campus in 2017. A video highlighting construction progress can be viewed at AState.edu/QueretaroProgress. Arkansas State University Campus Queretaro site in Mexico. Edmundo Ortiz, the General Director of ASUCQ who is leading the campus development project, said AYESA, a global engineering, consulting and construction conglomerate based in Spain, has set up offices at the site to manage construction of the state-of-the-art facility. Ayesa’s portfolio of work around the world includes major infrastructure projects such as canals and desalination plants. Interest and support from governmental leaders in Mexico has been important, Hudson and Ortiz said. Alejandro Ochoa serves as mayor of the municipality of Colon, which is the actual location of the campus near the international airport serving Queretaro. He joined the A-State delegation on the tour and expressed his full support for the development. 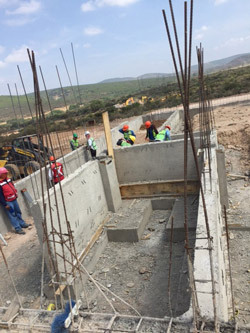 Construction workers at the Arkansas State University Campus Queretaro site in Mexico install concrete footings. The delegation that visited Arkansas and met with the governor recently included Alfredo Botello, the newly installed Secretary of Education for the State of Queretaro, and Eduardo Presa, Director of Government Innovation and Global Affairs for Queretaro. Presa is responsible for stimulating international commercial and cultural activity for Queretaro and suggested using the unique educational project as a basis for wider relationships between Arkansas and his state. The Mexico delegation also briefed members of Gov. Hutchinson’s cabinet, including Mike Preston, director of the Arkansas Economic Development Commission; Johnny Key, commissioner of the Department of Education; Dr. Brett Powell, director of the Department of Higher Education; and Dr. Charisse Childers, director of the Department of Career Education. While in Jonesboro, the Mexican leaders toured campus facilities including the Carl R. Reng Student Union, which will be in part duplicated on the Queretaro campus, and met with Provost Lynita Cooksey and other academic leaders. In Mexico last week, the A-State delegation participated in discussions with government officials, investors and potential technology providers. They joined Gov. Dominguez during a ceremony to inaugurate a new president of the Council of Consulting Industries and Enterprises. Arkansas State will become the first comprehensive U.S. university in Mexico with an American-style campus and concepts such as a “living learning” community in a country where almost all students commute and open professional exchanges for faculty, students and staff. The first phase of academic space for the campus is being designed to accommodate up to 5,000 students, with a goal of 1,000 students in the first year, Hudson said. Arkansas State will utilize funds generated from private gifts for startup costs, and ASUCQ will underwrite all construction and any operating deficits for up to three years after course offerings begin. The Mexico campus incorporates the A-State brand and logo and the university’s curriculum. Courses will be taught in English by credentialed faculty approved by Arkansas State, and degrees will be jointly recognized in both Mexico and the United States.